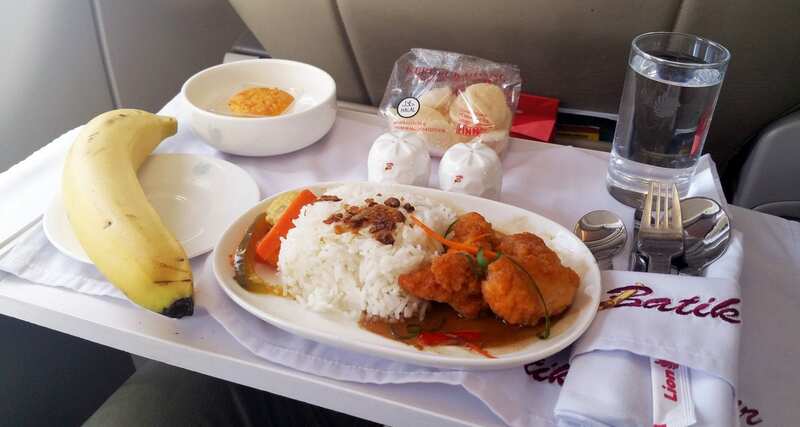 As part of a trip to Bali I decided I’d fly from Bali to Singapore the long way and went via Jakarta to check out the meals on Batik Air. The airline has been around only since 2013 and is part of the Lion Air Group; their central hub is in Jakarta. They offer business and economy class, and they’re a full-service airline offering free drinks and snacks to everyone on board, they are in direct competition with Garuda. My flight would take me from Jakarta to Singapore on a lunchtime service with a flight time of about 1.5 hours. I booked business class to take a closer look at what they’re serving inflight to premium class passengers. Before departure the cabin crew offered drinks, a refresher towel and a packet of cashews, I selected their signature lime drink to sample. The service onboard was good, not fantastic but not bad either. For lunch, I had the crumbed chicken served with rice and oyster sauce. While tasty it was served slightly cold (but then again I could have been taking way too many photos and it simply just got cold) I’ve had better in business class and even worse so I’d say this was middle of the road. I thought it was quite funny that they merely slapped a banana down on the plate, most premium cabin airlines would have cut it up and presented it better. But first world problems, right? I wouldn’t hesitate flying them again, but I think I’d also like to check out a few more Indonesian based airlines.